The Mute Swan is an exotic species in North America. It is native to Eurasia and was introduced to this continent from the mid-1800s through the early 1900s. Individuals were imported to many areas of North America as an adornment to city parks and large estates, and for zoos and aviculture collections. All North American feral Mute Swan populations originated from the release or escape of individuals from these early captive flocks. The largest concentration of Mute Swans now occurs along the Atlantic Coast from Maine south to the Carolinas. Populations have increased dramatically since the 1970's and show few signs of slowing. Smaller flocks occur in the Great Lakes region and the Pacific Northwest. 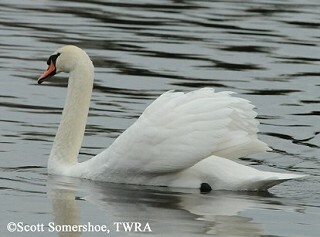 As an exotic, feral species, the Mute Swan has had significant effects on the ponds and lakes they inhabit. Potential effects range from overgrazing aquatic vegetation to displacing native waterfowl. Description: A large white swan, generally unmistakable in Tennessee. Distinguished from other swans by its long, S-curved neck and its orange red bill with a large, black, basal knob. 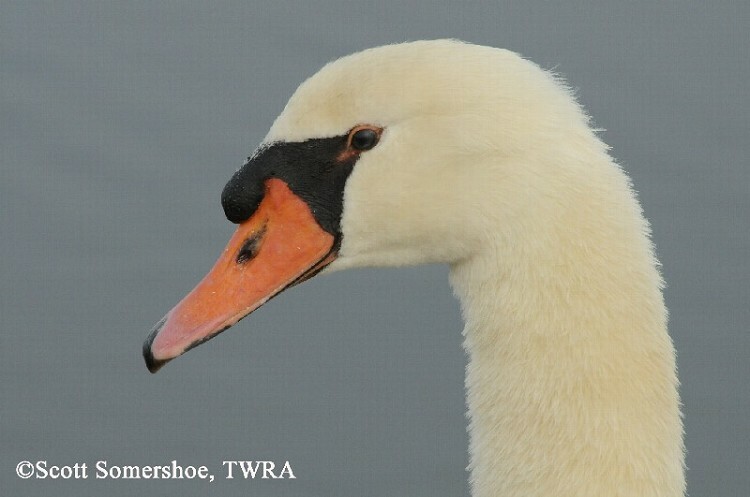 Tundra Swan is a rare bird in Tennessee, but they have dark bills without notches at the base. Habitat: Municipal ponds, shallow saline embayments and coastal ponds, large, slow-moving rivers, and lakes and ponds. Diet: Typically aquatic plants and some invertebrates. Nesting and reproduction: Pairs vigorously defend territories and their young throughout the nesting cycle. Not known to commonly nest in Tennessee. Fledging: Cygnets leave the nest shortly after hatching and are capable of swimming within hours of hatching. Nest: Nest is an open bowl in a large mound of aquatic vegetation, lined with softer vegetation and a little down. Usually placed on mound on bank, island, or reed bed. Status in Tennessee: Exotic bird not native to Tennessee. Rarely found across the state and any populations located need to be monitored closely. 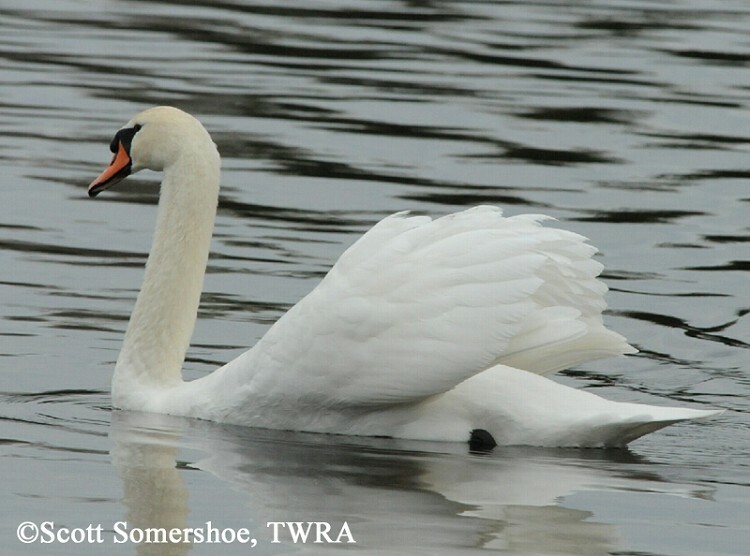 First Mute Swan was found in Tennessee in Sullivan County in January 1970. One of North America's heaviest flying birds, the Mute Swan is highly territorial. It forms strong pair bonds and has few natural predators. They will vigorous defend nests and attack human intruders. The male is properly called a "cob," the female a "pen." Young Mute Swans are called cygnets. They are found in two color morphs. The gray chicks start off with gray down and grow in gray-brown and white feathers, giving them a mottled appearance. White chicks have all white down and juvenal feathers. The Mute Swan is thought to mate for life. Changing of mates does occur, although infrequently. If a mate dies, they will remate.